Rates include: unlimited kilometres, UK and European Insurance and breakdown cover, double gas burner cooker, All cooking equipment, CD player, MP3/IPOD converter, side awning, dual battery, mains hookup, water pump, 42 litre powered fridge/freezer, more spacious and comfortable. 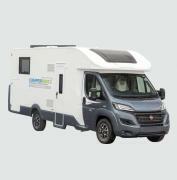 Rates include unlimited mileage, Value added tax (VAT), Comprehensive coverage with a deductible of £ 1.000 per loss, Fiat mobility program + emergency service, Awning, Dethleffs safety package, Air conditioning in driver's cabin, Bicycle rack, Outside cleaning, 2 bottles of gas(1 full bottle and 1 used bottle), Balancing wedges, CI cable, Cable reel, WC chemicals, Water hose and Saturday fee. PLEASE NOTE THAT THIS VEHICLE HAS 4 ADULT SEATBELTS, BUT ONLY SLEEPS 2 INSIDE OF VEHICLE. Base rate includes; VAT, Unlimited mileage and Comprehensive Insurance Cover for 1 Driver (based on clean and valid licence over 21 years old). Rates include unlimited mileage, Value added tax (VAT), Comprehensive coverage with a deductible of £ 1.000 per loss, Fiat mobility program + emergency service, Awning, Dethleffs safety package, Air conditioning in driver's cabin, Bicycle rack, Outside cleaning, 2 bottles of gas, Balancing wedges, CI cable, Cable reel, WC chemicals, Water hose, Saturday fee and dish set. PLEASE NOTE THAT THIS VEHICLE HAS 4 ADULT SEATBELTS, BUT ONLY SLEEPS 2 INSIDE OF VEHICLE. NB: This vehicle category will have either 1 x Double Bed OR 2 x single beds. 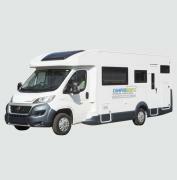 Rates include unlimited mileage, Value added tax (VAT), Comprehensive coverage with a deductible of £ 1.000 per loss, Fiat mobility program + emergency service, Awning, Dethleffs safety package, Air conditioning in driver's cabin, Bicycle rack, Outside cleaning, 2 bottles of gas(1 full bottle and 1 used bottle), Balancing wedges, CI cable, Cable reel, WC chemicals, Water hose, Saturday fee and dish set. PLEASE NOTE THAT THIS VEHICLE HAS 4 ADULT SEATBELTS, BUT ONLY SLEEPS 2 ADULTS & 2 CHILDREN INSIDE OF VEHICLE. 1 x DOUBLE BED AND 2 SINGLE BEDS AT REAR. 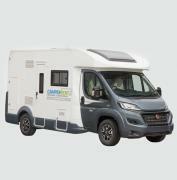 Rates include unlimited mileage, Value added tax (VAT), Comprehensive coverage with a deductible of £ 1.000 per loss, Fiat mobility program + emergency service, Awning, Dethleffs safety package, Air conditioning in driver's cabin, Bicycle rack, Outside cleaning, 2 bottles of gas(1 full bottle and 1 used bottle), Balancing wedges, CI cable, Cable reel, WC chemicals, Water hose and Saturday fee. Rates include: Unlimited mileage, VAT 0f 20%, UK breakdown recovery service, cooking utensils and comprehensive UK insurance with an excess of GBP1000.00. Just Go also provides airport transfer service with additional charge. 24 hours on call service. Rates include unlimited mileage, Value added tax (VAT), Comprehensive coverage with a deductible of £ 1.000 per loss, Fiat mobility program + emergency service, Awning, Dethleffs safety package, Air conditioning in driver's cabin, Bicycle rack, Outside cleaning, 2 bottles of gas, Balancing wedges, CI cable, Cable reel, WC chemicals, Water hose, Saturday fee and dish set. Rates include unlimited mileage, Value added tax (VAT), Comprehensive coverage with a deductible of £ 1.000 per loss, Fiat mobility program + emergency service, Awning, Dethleffs safety package, Air conditioning in driver's cabin, Bicycle rack, Outside cleaning, 2 bottles of gas, Balancing wedges, CI cable, Cable reel, WC chemicals, Water hose, Saturday fee and dish set. PLEASE NOTE THAT THIS VEHICLE HAS 4 ADULT SEATBELTS, BUT ONLY SLEEPS 2 INSIDE OF VEHICLE.